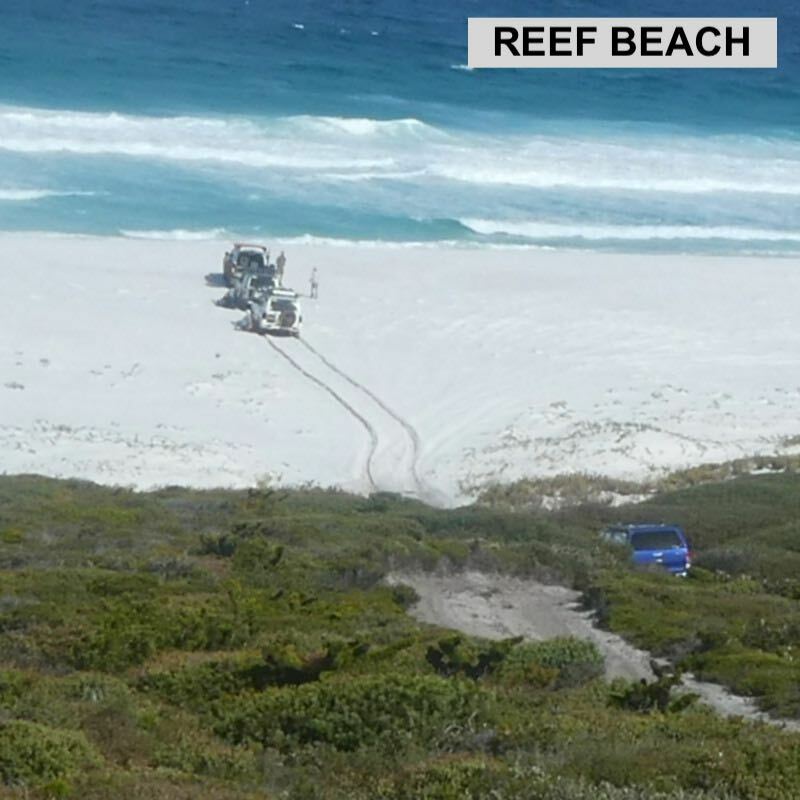 CONVOY: Bob & Bridget McPherson, Peter and Deearne Fisher, Gary Arcus, Peter Cole. TAIL END CHARLIE : Changed daily, as did order of convoy. 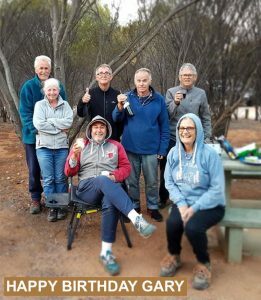 DAY 1 – Brian, Chris, Gary, Bob, Bridget met on Albany Hwy to travel down together – don’t know about anyone else, but I was excited to be getting away camping again!! We caught up with Peter C. at the Mallee Fowl Centre in Ongerup for lunch. 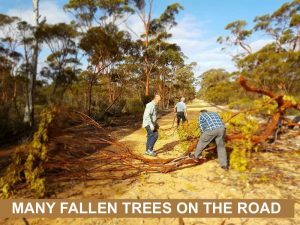 A very interesting place to visit if in the area – come on, who knew Mallee Fowls were nearly extinct in this area??? 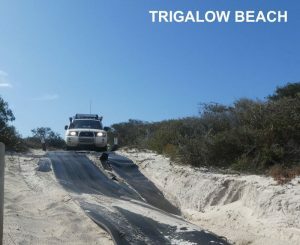 Four vehicles all towing campers made for a very interesting adventure into the Beaufort Inlet via the Pallingup Beach track – rocks, water, boggy sand, low branches with two rescues (using winches ) along the way! 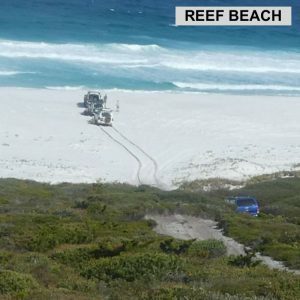 Great spot to camp, somehow the track going back out of somewhere, never seems so bad does it? No-one felt like lingering once we’d all packed up and had breakfast – also those dark clouds were a bit ominous! Slow going but no dramas to get back out. Back to the bitumen and down to Millars Point for a walk with great views and lunch. 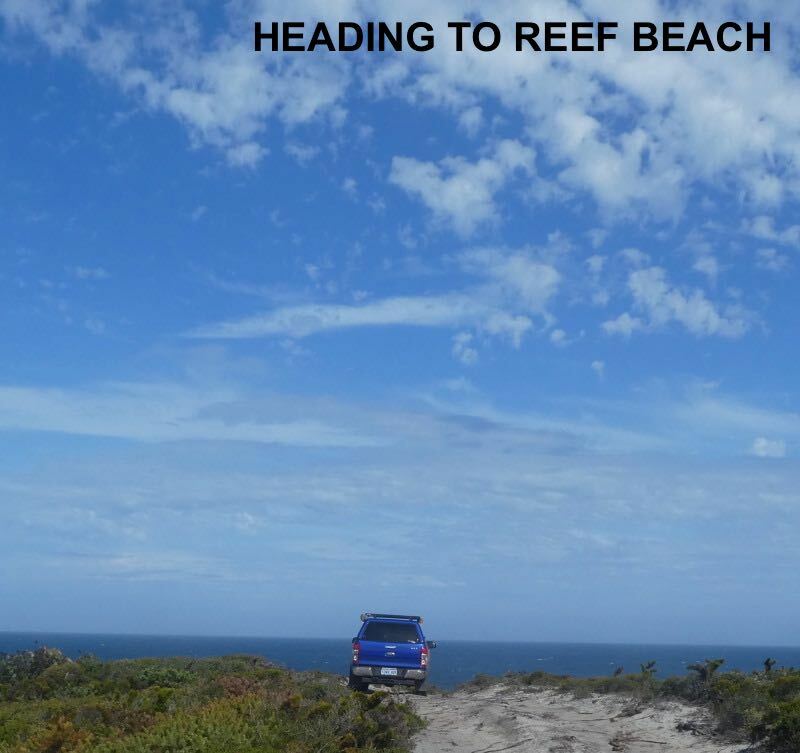 Onto Bremer Bay to meet up with Peter and Deearne and settle down for the next 6 nights while exploring the area. Campfires allowed in provided containers, which was a bonus. 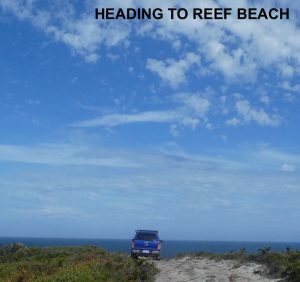 Day 4 – Day trip started with a visit to Reef Beach (as the name of the trip was Reef …..), very soft sand driving, along the beach complete with sandhills down close to the water. 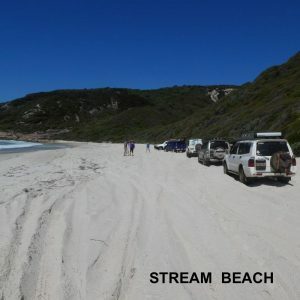 Very hot and not a cloud in sight – beautiful weather, hmmm a fair bit of complacency by the Mcphersons – rain, what rain? 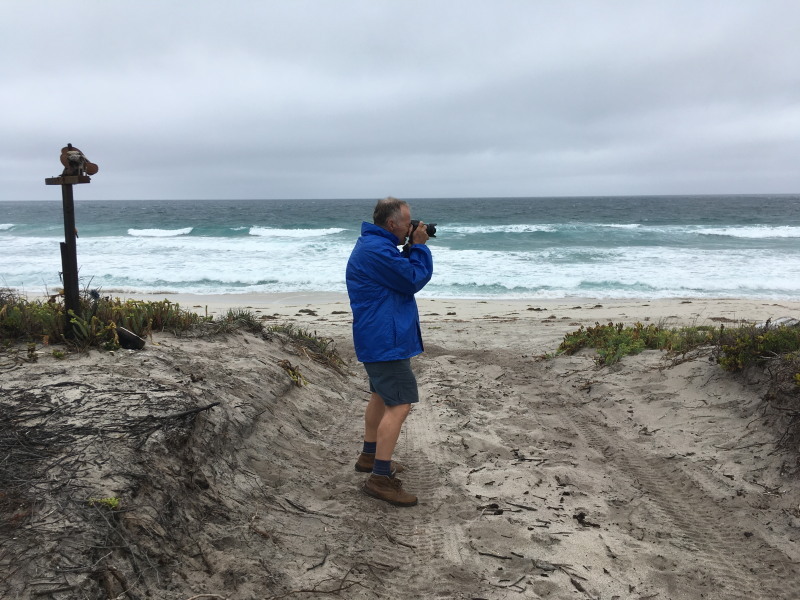 Some great views today – on the way in, ocean and large sandhills – on the way out, the scarp and distant mountains. Whilst on the beach having lunch we were entertained by dolphins and by El President, doing his environmental bit, picking up some rubbish edge of water, lost his hat and got a bit wet retrieving it! Day 5 – Leisurely start to the day with a breakfast at Bremer Bay Resort. A certain high official in the club had their credit card declined – of course, it was the pub’s mistake – hmmmm? Another ex-high official in the club’s tale of counting money when working in the bank – 3 for them, 1 for us – again hmmm, was he kidding us? Maybe not?? 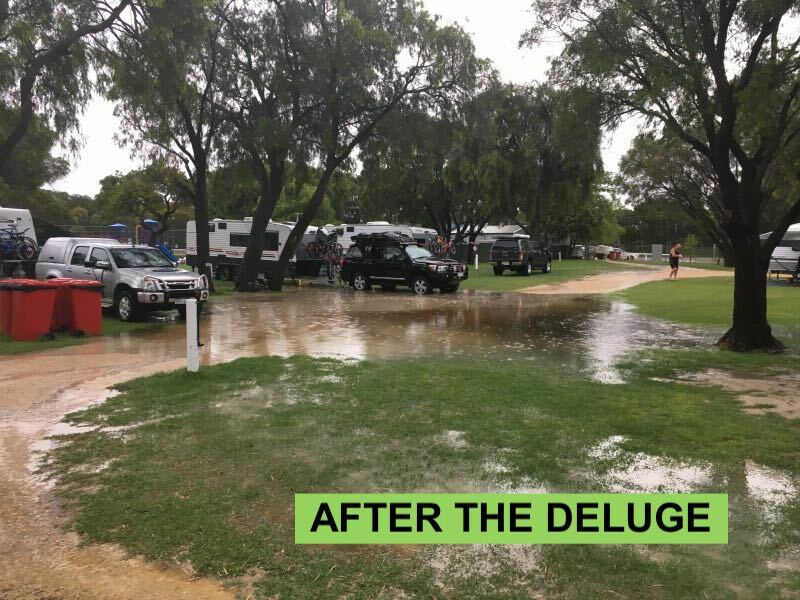 Day 6 – Well, what can we say – rain, hail, drowned campers, lightning so close it was like fire, thunder, rain and more rain ……….. definitely a day to hang around BB and visit Wellstead Museum – fascinating place if you’ve never been before, helps to have a lovely cafe too. 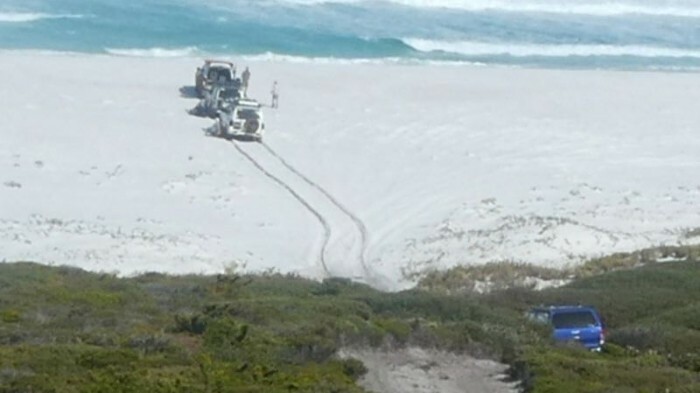 Just a funny tale – a lady came into cafe and told us we’d left our headlights on, so out Bob went, puzzled as he thought he’d turned them off – hopped in car, yep they were off, back out to check them, uh oh lights were on – much scratching of head, starting engine up etc …….. a truck further up the road had his full lights on and they were reflecting into ours – hahaha, kept Bob busy for at least 15 minutes before figuring it out! Storms had unbelievably cleared by late pm and we reckon Peter Fisher built the best campfire that night. Day 7 – heading out towards Quaalup again there was much evidence of recent rains – tracks were muddy and covered in water. Visited Corner Cove, Whalebone Point which was beautiful . Brian and Chris took us to see a blowhole at Point Hood, which they had rediscovered in recent times after visiting years ago. (think they were quite proud of it, until someone said (totally underwhelmed) – “is that it”?? – hahaha). Meal out at BB pub that night!! 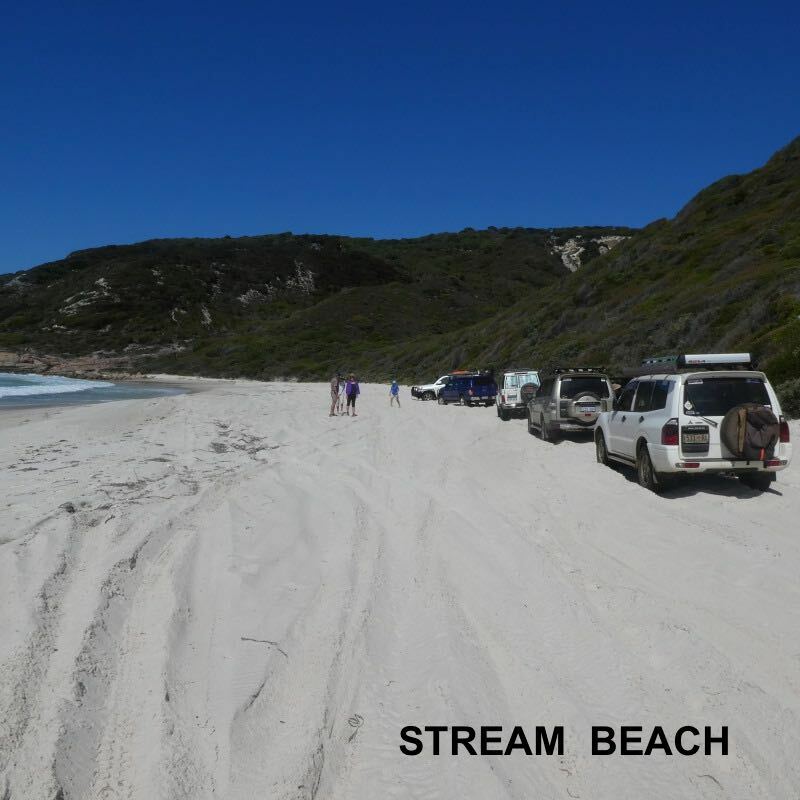 Day 8 – Packed up in Bremer Bay and off – noted when passing most of the National Park roads were closed due to recent rains. Stopped off to see John Dunn’s grave (Dunn’s track), who was speared and killed by Aboriginals in 1880. 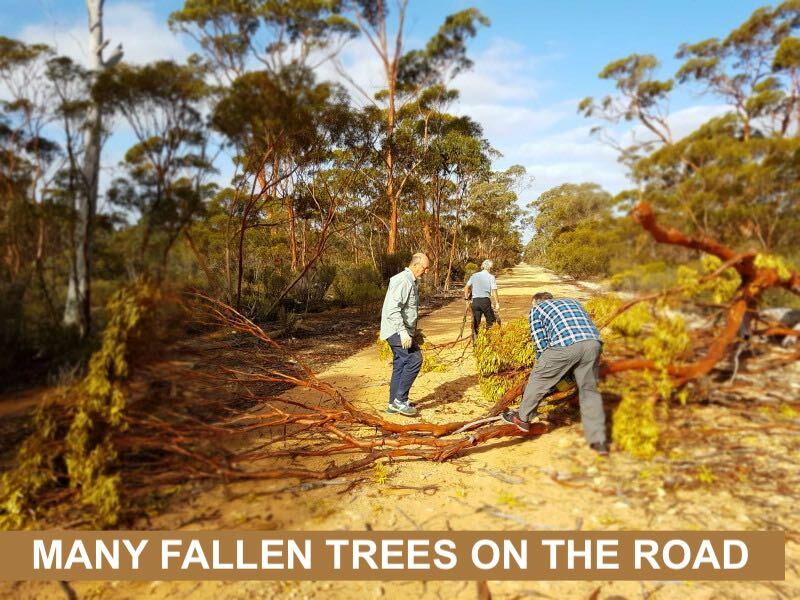 It is near the old homestead on the property of Cocanarup which was taken up by the Dunn brothers in 1872. “Terrible stories abound, but cannot be verified, of the vengeance exacted by John’s brothers on the Nyungars” – up to 30 Nyungars killed, so not a happy area. After Dunn’s grave we visited an old limestone kiln in the creek bank, a lot of old stuff still there to see. Ravensthorpe to re-fuel and re-stock . 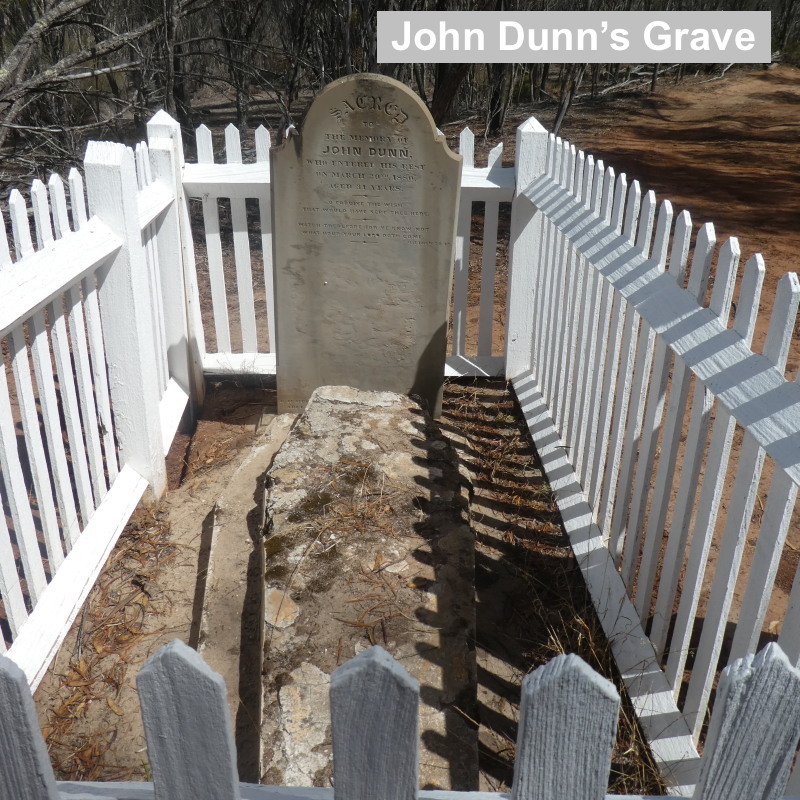 Visited the museum where the original wooden cross for John Dunn’s grave is kept – it was carved by his brothers. Day 9 – Dunn’s track and visiting rock holes along the way. The first half of this track was extremely tight, scratchy, rocky and was definitely not well used. 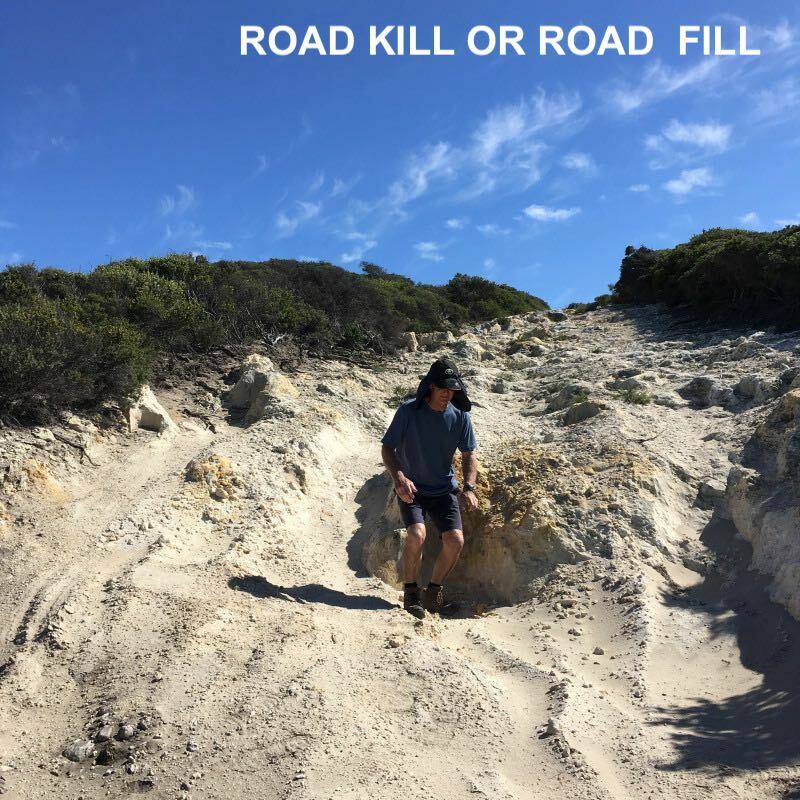 However when we came to the Cascades road crossing (lunch and repairing a puncture on one vehicle), the track was fine from there up to Peak Charles – sandy and open. Day 10 – It was shaping up to be a hot day and no-one took up Brian’s challenge to climb to the top of Peak Charles – made it to Mushroom Rock instead, pretty good views from there anyway. Visited Moir Rock and catchment with tank (carbon copy of Karralee?!) and also Stennant Rock – Macs were kindly provided with lunch by Deearne after our Tvan door jammed!! Day 11 – Did the Dundas heritage trail, ending in Norseman for lunch and a shower. Camped off the Norseman-Hyden road – at Banks Rocks – a track off the Victoria Rock road, a great spot away from the normal camps along this road. Day 12 – Walked around Banks Rocks – at the back is a Wave Rock lookalike. 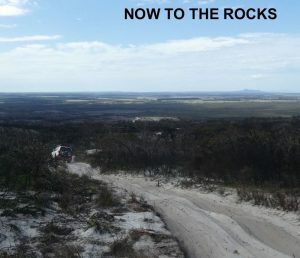 Up to the top of the rock for a great view and some very weird rock formations.